Mining always leaves its footprints in both the sands of time and on the lives of the people and their lives. You may think you have seen it all - especially if you have seen or lived in the horrors of oil activities in the Niger Delta. I thought so too, particularly because I have devoted at least two decades of my life in persistent pursuit of polluted lands (at home and abroad) searching for ways to comprehend the great harm generated by extractive activities. Some of the places that have left deep impressions in my heart are documented in my book Oilwatching in South America - or, Guana Guara, Mudfish Out of Water: A pollution tour Of Venezuela, Curaçao, Peru and Ecuador. This book is more or less the diary of a pollution tour of these countries carried out in 1997 under the auspices of Oilwatch International. Others can be found in To Cook a Continent: Destructive Extraction and Climate Impacts on Africa. The field trip was in Mpumalanga Province where mines literally turned to walking in minefields! No, we did not rush to the mines. Our first port of call was the offices of the South African Green Revolutionary Council (SAGRC) in Witbank. It was early in the morning, but the comrades were already waiting to receive us. Led by Matthews Hlabane, we were quickly given a short introduction to the Witbank. Mining started here in 1896 and with it began a reign of land grabbing and pollution From the 1950s, the environmental problems began to intensify and were glaring and undeniable. Acid mine drainage polluted the water and coal dusts took over the air. With these contaminants it was not a surprise that the locals began to suffer from headaches, dizziness, kidney failures and other diseases. We were informed that there are eight coal-fired plants in Witbank and up to 700 mines from where coal and platinum are dug. But that is not all as there is a pile of 5000 applications for mining permits, with many of them “linked to the ruling party”, we were told. Overall, there are 6000 abandoned mines in the country and among these are the many abandoned coalmines of the Highveld. He regretted that there were no direct gains to the community even though so much “wealth” was being excavated from beneath their feet. The coal extracted here is used for electricity generation and for export. The level of contamination here is so high that an estimated 30 billion Rand will be needed for environmental rehabilitation. We were told of sinkholes, unstable grounds and about the impacts on entire biodiversity. Our visit took us to the abandoned Transvaal and Delagoa Bay Mine. 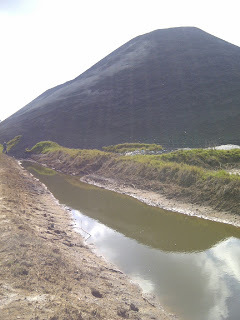 On arrival we were greeted by a mountain range of various wastes and polluted water seeping from the tremendous pile. Walking in this field requires extreme caution. We had to go in a single file, trusting that our guide knew upon which spot to tread and which could be considered as safe ground. We were bemused and some thought it was preposterous for anyone to insist that we could not walk where we pleased. Soon enough we all saw why rebellion was not a good option here. There were cracks in the ground best picked out by trained eyes. We were told of, and shown sinkholes scattered in the fields. Any place could crack up and anytime and a yelp may be the only goodbye to be heard before the victims disappearing into netherworld. These mines are located between two townships and kids and others traverse these burning mines daily either to school or to work. Some kids are said to have fallen into these sinkholes. And someone hazarded that criminals may also have used these burning pits as convenient places to bury their crimes. Spontaneous fires started in the mines in the 1930s and they were eventually closed in the 1950s. Interesting. It is said that the fires in the mines were burning both the roof supporting pillars and the roofs themselves. We guess that before the mines were closed, perhaps while one portion of the mine was burning, miners were pressed to keep digging at other parts. That can be understood in an apartheid context. But why are the flames not extinguished and the land re-mediated today? Our friends told us that because of lack of adequate public response to their complaints about the air quality and other pollutants, they have had to train themselves on how to do that for themselves. In fact, we were told of occasions when officials bring testing equipment and the community folks were the ones who showed the officials how the equipment were operated. Talk of community empowerment! Tests show that some of the water bodies here are either very acidic or highly alkaline. We were told that to keep healthy, workers in this factory are compelled to drink milk everyday. I could not laugh. I have personally heard at an environmental health workers workshop of oil company workers (machine operators) in Nigeria who are urged to drink milk as a way of keeping their bodies purified of pollutants. This myth has also been heard of in India. Workers are kept in the dark hopes that milk eliminates the impacts of pollution. See my 2010 article titled The ‘Milking’ of Oil Workers for more about this and the cynical actions of corporations. Our next port of call was the Old Coronation Township sitting on Old Coronation coal mines. The ground here is very unstable. We were taken to a huge pit into which a preschool disappeared after the ground gave way in 2012. Sinkholes started happening here more than five decades ago. It was one story of woe after another. We saw women and kids digging for the occasional lump of coal. We heard of resource and job opportunities conflicts with migrant workers from the SADC (Southern Africa Development Community) region. We saw extensive acid/water ponds. Devoid of life as expected. “The graves in Highveld are full,” one comrade tells us. “If you live here and drink the water, there is a 70 per cent chance you will end up with liver problems.” Sadly, kids sometimes swim in the warm ponds and there is a chance that they gulp in the lethal water. There is a high incidence of sinuses, asthma, tuberculosis and others. The acting was excellent and the storyline and message was clear and direct. Global warming was better termed “global burning” and humans were shown as anointed to be the most foolish specie on earth. The youngsters declared, “our governments have failed us, but we will not fail ourselves”. This blog was first published on 21 May 2013 in Nnimmo's Reflections (Oil Politics). 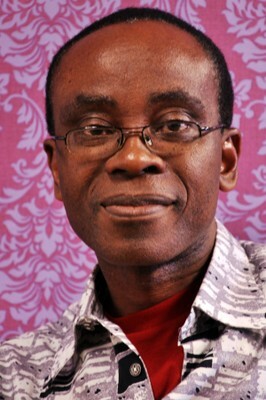 Nnimmo Bassey is the International Coordinator of Oilwatch Africa and is based in Nigeria. He is the former Chair of Friends of the Earth International and Executive Director of Environmental Rights Action (ERA/Friends of the Earth, Nigeria).